The story of Dark Souls is best described as laissez-faire. The series is in no hurry to actually tell you what's happening, opting to let you find out yourself by exploring the world, chatting up rare friendly NPCs, and picking through scraps of lore. Which is fine and all - Dark Souls has never been about story - but it does mean the overarching plot can be a bit confusing at times. So much so, in fact, that even the folks at From Software often don't know what's going on. 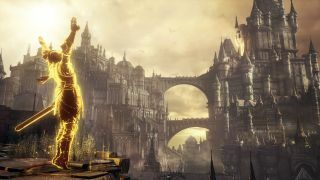 As VG24/7 reports, Dark Souls director Hidetaka Miyazaki discussed video game narratives at a recent event in Croatia. Miyazaki explained that he writes stories to suit gameplay, not the other way around, which certainly lines up with Dark Souls' approach. He also said he'd be interested in directing a more story-driven game in the future, using Rockstar's Red Dead Redemption 2 as a reference. However, if that's going to happen, Miyazaki says he'll need to work on explaining the stories of his games to his coworkers, because apparently even they frequently lose track of the plot of the games they make. For what it's worth, video game development teams are huge and multi-faceted, so it wouldn't be all that unusual for, say, someone on the Dark Souls or Bloodborne environment teams to miss some subtle plot points handed down from a lead writer. Even so, given how famously circuitous and vague From Software's action RPGs can be, I love the idea that even their creators are sat their scratching their heads wondering what the hell all this fire and darkness business is really about. Miyazaki previously said he'd be interested in taking a crack at a battle royale game, but if that ever happens, I don't think it'll be too heavy on story.